Home Article Bug in Google Lessons Learned Software Testing Thinking Tester Tutorial Testing Google - Boundary Value Exploration! Ever wondered about the boundary of Google’s Search box? Ever tried to test it? Well, recently during an online discussion, I was testing it with a friend [Gopali Virmani – She is the one who found and informed me about some more naughty keywords (key-letters actually! – and the letters are: b, e, f, i, j, l, s, y) capable of reproducing java script error that I have mentioned in Yet another Bug in Google Suggest!]. Although I have tested Google’s search box several times before, this time I got some extra information while testing it. So I wanted to share it here. Note: I didn't have any specification mentioning the proposed boundary for the Google’s Search box that I was testing. So there was no scope to follow the so called Boundary Value Analysis (BVA - fame ISTQB) where we are given a range and are expected to test the boundary with values exactly matching the upper and lower boundary, values just above the boundary and values just below the boundary! For a simpler example if a boundary range for a text box were given as 5-100, BVA would expect one to test the boundary with test data of length 4, 5, 6, 99, 100 and 101. Look closely and you would know that here we are just adding and subtracting the upper and lower boundary values with ONE (1) and taking the resulting value as test data. To me it appears a simple arithmetic operation rather than any “Analysis”! My 7-year-old cousin can add and subtract a number by 1. Then can he do BVA too? Think over it. I would rather like to leave it to the readers to think and decide whether to still call it “Boundary Value Analysis”! Oops! Looks like this is turning out to be yet another controversial post! But believe me; I never wanted to make it one. So better I should come back to the main theme, i.e. testing the boundary of Google Search box and stay away from controversy. :) Before I come to the procedure I followed while testing, let me share my testing mission first. Testing Mission: To test and identify the different possible boundaries of Google’s Search box and any more information related to it. Software testing is the process used to help identify the correctness, completeness, security, and quality of developed computer software or application. Testing is a process of technical investigation, performed on behalf of stakeholders, that is intended to reveal quality-related information about the product with respect to the context in which it is intended to operate. This includes, but is not limited to, the process of executing a program or application with the intent of finding errors. Quality is not an absolute; it is value to some person. With that in mind, testing can never completely establish the correctness of arbitrary computer software; testing furnishes a 'criticism' or comparison that compares the state and behaviour of the product against a specification. I pasted it in the Google Search box and hit “Google Search” button. I got at least 3 important information in the search result page! Look just below the Search box and you will notice some extra lines of text containing some interesting information. c) "but" (and any subsequent words) was ignored because we limit queries to 32 words. Interesting! Aint they? The first two messages tell us about the way Google interprets “OR” and “AND” when they are used inside a keyword string. And the last message is really interesting. It tells that Google limits the queries to 32 words. Looks like a boundary. Isn’t it? I tried with keywords with different word counts. But got the above message, only when it was with more than 32 words. So this almost confirmed my inference that the maximum allowed words in a Google Search string is 32 words. If it is more, Google just ignores the rest! 3. This time I was to test the maximum allowed characters in the Google Search box. So took the above paragraph (Wikipedia’s definition for Software Testing) and tried pasting it in the Search box several times (in fact copied the paragraph and held down Ctrl+V key combination after clicking inside the Google Search box!). Sound’s crazy! But let me tell you, to explore something as a tester sometimes we have to be little crazy. :) Well, wait! The cursor inside the Search box looked like the pasting had been stopped! Hurray! I tried to enter some words manually inside the Search box. No! I couldn’t feed any more character into the Search Box. Another boundary? Let’s see. I copied the whole search string from the Search box and pasted it into a new MS Word document. Used Word Count feature (Alt+T+W) of MS Word and found the total Characters (with spaces) to be 2,048! The number itself was amazing – 2,048 – 2 to the power 11 – double of 1,024 – 2k. Got any clue! Then I hit the “Google Search” button (with 2,048 characters already in the Search box). Bang!!! I got “Internet Explorer cannot display the webpage” message! Well, this is not what I intended to get. Anyway, I tried different things and pressing F5 (Page Refresh) was one among them. Refreshing the page displayed Google 400 Bad Request page with message – “Bad Request; Your client has issued a malformed or illegal request”! Well, this message is not what surprised me. But, this should have been displayed straight-away when I tried with the 2,048 long Search string. 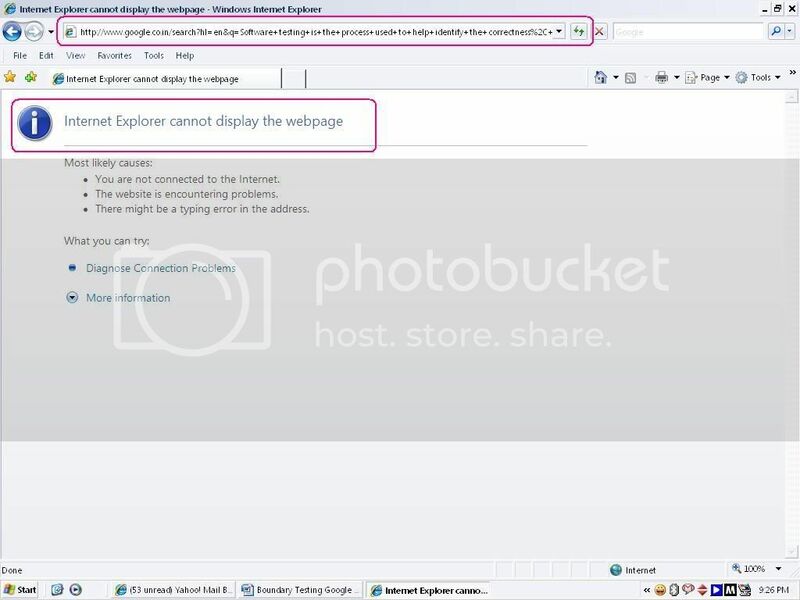 Why was I displayed with the Internet Explorer cannot display the webpage” message? I tried it several times and every time I had to see the Internet Explorer cannot display the webpage” message instead of the Google 400 Bad Request page! Could this be a problem (bug!) with Google? I am still wondering. 4. I was curious to see the boundary where I could directly get the “Google 400 Bad Request” page without having to see the unwanted “Internet Explorer cannot display the webpage” page. So I kept reducing the maximum allowed characters (2,048) on a regular interval (reducing 20 characters at one go) and a little more investigation revealed another boundary! It is 1,980 Characters (with spaces). If your search string is less than or equal to 1,980 Characters, then you won’t have to see the “Internet Explorer cannot display the webpage” page and directly you will get the “Google 400 Bad Request” page. a) The minimum allowed characters in a search keyword is 0 characters. b) The maximum allowed words in a search string is 32 words. The rest of the words are ignored by Google while processing the query. c) The maximum allowed characters in a search keyword is 2,048 characters. But this displays an “Internet Explorer cannot display the webpage” page. Refreshing this page however shows a more graceful “Google 400 Bad Request” page. d) If your Search string is less than or equal to 1,980 characters, you will be displayed directly with a “Google 400 Bad Request” page. e) I am not sure about a case when my Search string contains 1,980 characters and there are some available search results! In my above experiment with boundary testing, I have tried to explore the boundary instead of taking a fixed boundary and testing it with a set of six test data! Update: If your Search string is more than 2,048 characters and you try to paste it as your keyword phrase, Google truncates the characters after the 2,048th character and directly displays the “Google 400 Bad Request” page. Regarding the 2048 limit on the search string - that's simply the attribute added to the input box for search - i.e. they've set input maxlength=2048 within the html for the input box. You could test 2047, 2048, and 2049, but you'd have to realize that you would be testing the browsers implementation of the textbox control, and not really google...although I guess I would still test 2048 and 2049 to ensure that those values worked, and were truncated correctly...I think. Accidentally hit submit on my last comment before I was done. Anyway...good investigation, and some interesting results. It may be interesting to try these tests in different browsers and perhaps even on a different search engine like search.live.com. The interesting with live.com is that they don't limit the input field, so there's no "known" limit (that I know of) on the number of characters that can be searched for, nor can I find a limit on the number of words in a query. However, using techniques similar to yours, I'm finding that 2020 appears to be the character limit. It may have to do with the http command line (2084 for a string of 2020 characters), but I'd have to look into that to figure out for sure. I was really impressed by this post of yours and started doing a little bit of the same myself. I found out that It was not 1980 characters limit which was causing Bad Page request error, however it was the positioning and placement of few characters like @, # and ( which i could figure out while doing the same was causing the Bad Page request. I do not know if i am right in the same, however i feel that we need to explore more on the same to find exact reason. Here is what i found out. You might want to have a look at the same and provide me your comments. I have gone through your post. I saw you using some special characters to get the "Google 400 Bad Request page". Good effort. But the Bad request page is NOT an error. Rather it is an warning message to let the user know about the possible malformed or illegal request! So the boundary for getting a Bad Request page can be anything. And I suppose it does not have any fixed boundary. 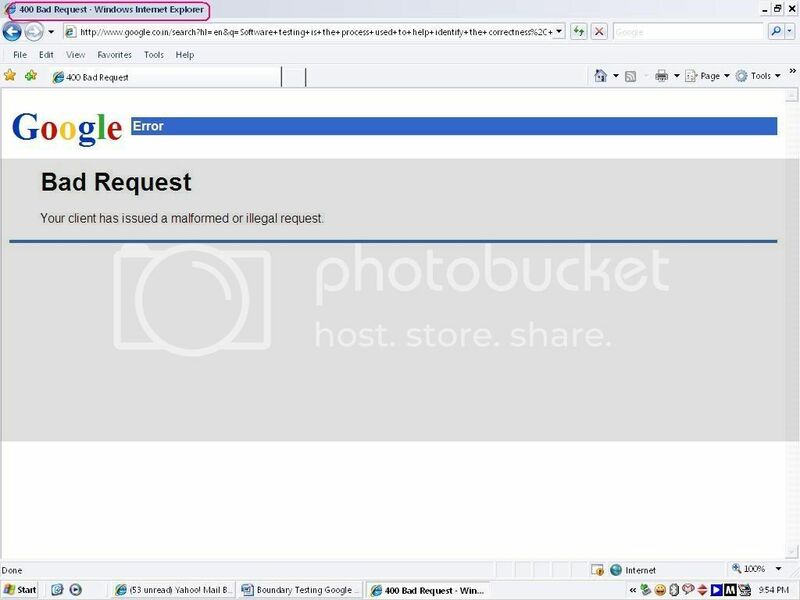 Whenever a request is malformed or illegal this message will be displayed. Coming back to my inference, I think the boundary 1,980 is for getting or not getting a "Internet Explorer cannot display the webpage" message. Furthermore, you might notice that I have not used any of the special characters that you have used in your case. Still I got the "Google 400 Bad Request page" as the request was supposedly malformed or illegal! Anyways, great effort from your end. Keep it up. I explored google search today. I was interested in your findings. In the process, I observed a max limit for 2048 for the search text box. I also observed that the maximum length of the search string for which I did not get a Bad Request page was 2012. I then tried the advanced search options, by choosing file types etc. Interestingly, as I expected, the length of permissible string further came down. There was an interesting observation. The URL of the complete search for all the searches which did not give a Bad Request page remained 2068 characters in length. I noted down my observation: Whatever search string you give, the maximum permissible search string which will not give bad request page is a string which in combination with the search options used does not give a URL of length more than 2068 chars long. E.g I used a long string..the permissible string length was 2012 chars. Now I gave the condition filetype:pdf along with the same search string. I got a bad request page. The reason is that this search option is appended to the URL. We see that the seach option for PDF files modifies the URL to include filetype%3Apdf+ in the URL. With www.google.com the URL length decreased to 2066 characters from 2068 characters. Note that there is a difference of two chars in the length of server names. Now I measured the length of the query string. The length of the query string in both the cases was: 2037. So, my conclusion is that whatever search criteria results in a query string of more than 2037 characters for google, results in a Bad request page. Great observations, I must say. Thanks for spending time to explore boundary of Google and leaving your findings here. Soon, I will look into your findings. Great job! It is really good to read your articles, which are making my testing shoes stronger. I tried few experiments with "youtube.com"
One interesting thing i found out is when i am entering space , i mean to say blank space it is taking it as null . What kind of conclusion can be drawn from this , please assist. I tried the same experiment with google. 1. How many boundaries did you discover in your testing? so, interesting thing here is to note a "string" type input variable - scalar variable can have many boundaries depending upon the processing logic of the application and platform (browser, OS, even the hardware). This clearly exposes the "hollowness" traditional approaches to BVA as mentioned in many books and certification exams like ISTQB. 2. Neither you or people who commented (like Alan) did not mention about HTTP GET limit of 2048 in the browser - where the data to be passed to server is appended to the URL. 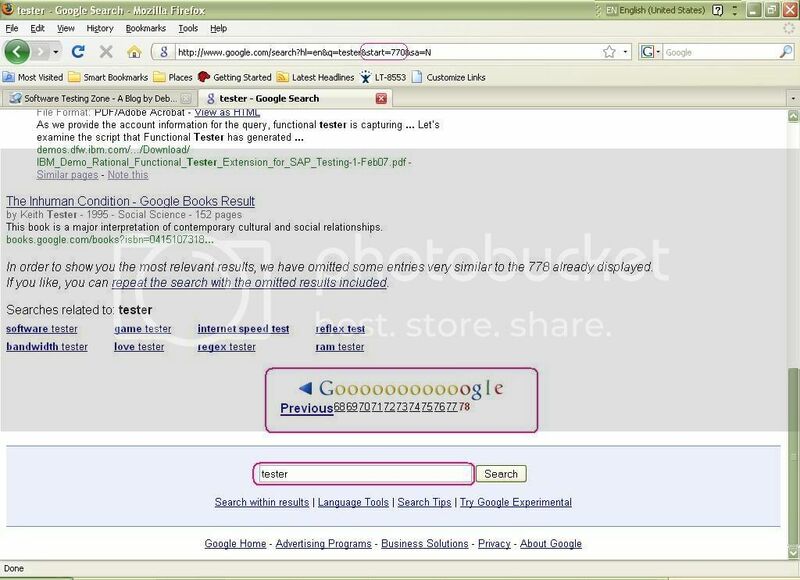 Google uses http GET method to pass the search query to server. so the limit of 2048 seems to have been imposed by the HTTP - GET. Since the search string is part of URL, IE imposes the limit of 2048 characters for the GET portion. So this is not a "Google" search boundary. It is boundary of browser. Howzzzzzzzzzzt? So you might want to investigate bit on google search on firefox. You will be able to do more ... as URL size is bigger there. 3. Thanks for quoting my blog on BVE in the post, it would have been better if you have referred it earlier in the post as your post is titiled as such. What you have done is part of BVE ... what I call as BVE "outsider's view". If you know the internal details of how the string is processed (such as boundary of 32 words) you will get few more boundaries of google search string. Also you check out Non ASCII strings. I observed that a string containing only character "a" having length 1980 character gives "host" not available error (this is custom error) - actul error would be something on the lines of what you have observed. Thanks for your further investigation on the possible boundary of Google's Search box. The thing that struck me the most is how - HTTP GET limit is of 2048 in the browser and how the limit of 2048 could have been imposed by the HTTP GET. I should have taken this point into account while summarizing my findings and predicting the possible boundaries. Thanks for sharing the URL: http://www.boutell.com/newfaq/misc/urllength.html. 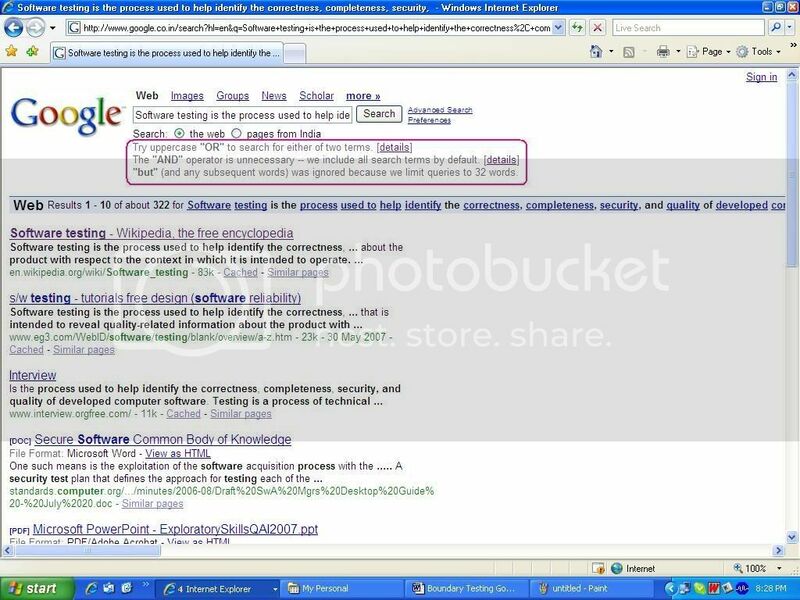 This is a great eye opener of how the actual boundary of Google can get masked if tested with different browsers. I will try to test it with other popular browsers like (Mozilla Firefox and Opera) and probably will write a new post consisting of my findings. Hi This is very inteserting topic . Yet i also tried testing in different web sites and found yet another thing in google search. When we type 2048 characters without any spaces and clicking Search button doesn't shows up anything , even the message Page Cannot be displayed . I just tried to retest your observations. In my case, I had left the google's preference unchanged (10 results per page, moderate filtering ON). I entered "tester" (of course without quotes) in the Google Search field and hit enter! It displayed about 77,900,000 for tester, which totalled 78 pages (in contrast to your 84/85 pages). This can be possible due to several reasons (a different preference set in your case, say safe search OFF etc). It can also happen due to the change in Google's search algorithm that takes place continuosly. So I had no way to retest your 84/85 page anomaly! But in my case the last page was the 78th page. I scrolled through the pages (10 pages at a times) until I reached the 77th Page. I could see a Next button (which was logically appropriate). Clicking on the Next button lead me to the last page (78th). But interestingly here I did not see any Next button like you have mentioned. So to me, Google worked as it should have, i.e. No Next button on the last search page. I am attaching a screenshot of it for your reference. Click here for the attached Screenshot I would like you to retest this and come back with your findings. Anyway, I have taken a look at your URL! Its really interesting how clicking on the 79th page/Next does not actually take you to the next page (reason! may be no more search result to display!) and simply REFRESHes the page! This is certainly a glitch with Google! I could reproduce it with your same keyword (tester) a few times. But most of the time the total number of search results varied! I tried with other few keywords (random) too! And I did not see this glitch there! So looks like Googles *sometimes* acts in a funny way for some particular keywords (like "tester")! Well, I did not know Google does not like "tester"! :) Jokes apart, may be someone from Google can throw more light on this, in case (s)he is reading this post! Any clue guys? NOTE: I have tried this both in IE as well as Firefox 3! Thanks for ur reply.I think as a tester i was on the right path am I not Debasis? I am certainly impressed by the curiosity that you have shown in taking up a testing exercise and I appreciate that. But remember, this is just the beginning! Often complacency turns out to be the biggest career-killer for a person. Try harder. Explore more and experience more. The more you test the more you get better at it.